Egyptian President Mohamed Morsi has declared a 30-day state of emergency in Egypt and called for national dialogue, after ongoing clashes and protests led to the deaths of 49 people and left hundreds injured. 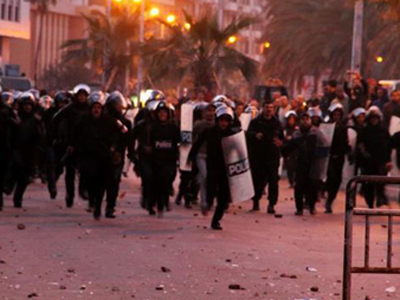 Morsi set curfews in the most volatile cities of Port Said, Suez and Ismailia. 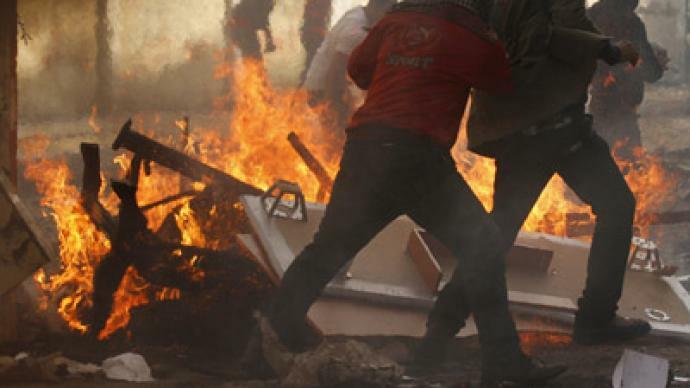 Seven people were killed in Port Said on Sunday. "I promised not to take extraordinary measures unless I was forced to, and here I am doing so. I announced a state of emergency in the cities of Ismailia, Suez and Port Said for a period of 30 days," President Morsi said in his televised address on Sunday evening. "I instructed interior ministry officials to strictly deal with whoever threatens people and public and private institutions," he said. In his address the president also called for a meeting with senior politicians and groups. The spokesman for the main Egyptian opposition coalition told Reuters that he wanted more details about an invitation for dialogue. The state of emergency is set to start at midnight. "The protection of the nation is the responsibility of everyone. We will confront any threat to its security with force and firmness within the remit of the law," Mursi said. Shortly after the state of emergency was declared, some 200 people marched in the streets of Ismailia, Reuters reported citing witnesses. "Down with Mursi, down with the state of emergency," they chanted. 18-year-old Abdel Rahman Farag was killed by a gunshot wound to the chest, the head of Port Said hospitals told Reuters. No immediate details were available about the other two victims. More than 416 people suffered from teargas inhalation, while 17 sustained gunshot wounds, he said. “There are still bloody and chaotic scenes in Port Said…the army has been deployed…eyewitnesses say they see tanks on the street at the moment," journalist Bel Trew, who is in Cairo, told RT. Muslim Brotherhood leader Mohamed El-Beltagy has urged Egyptian authorities to "step in with full strength in order to prevent the killing of civilians." Thousands of people turned out for the funerals of 35 rioters who were killed in Port Said on Saturday. The mourners shouted,"There is no God but Allah, and Morsi is God's enemy" after praying for the dead at the city's Mariam Mosque. Teargas was fired in the vicinity and gunfire was heard nearby. Emergency vehicle sirens were also heard, a witness told Reuters. 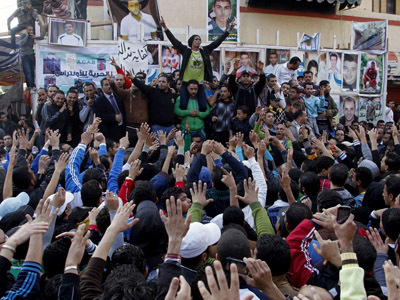 Thousands of demonstrators also gathered in Cairo's Tahrir Square on Sunday. 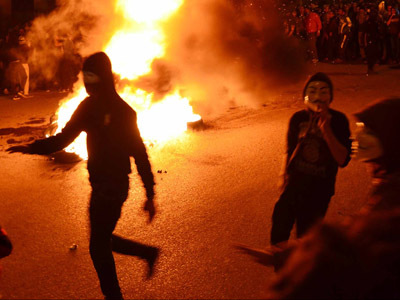 Protesters threw petrol bombs at riot police who responded by firing teargas. Rallies have been taking place in Cairo, Alexandria, Suez and half a dozen other places, many of which have become violent. Protesters have taken to the streets in greater numbers following Saturday’s death sentence verdicts over a stadium stampede last February. ­The Egyptian city of Port Said has experienced the most violent clashes, with 32 killed on Saturday alone. Armored vehicles and military police have attempted to quell the violent protests in the town of 600,000. However, protests reach back to Friday when nine people were killed in a separate demonstration against of the Islamist Egyptian President Mohamed Morsi. ­The outbreak of violence is a consequence of Saturday’s sentencing of 21 people to death for their role in the deaths of 74 people at a soccer stadium riot and stampede last year. Spectators were trampled and eyewitnesses saw some thrown off balconies following a match between Al Ahly and local team al-Masri. Many Al Ahly fans accused police of playing a role in the deaths. 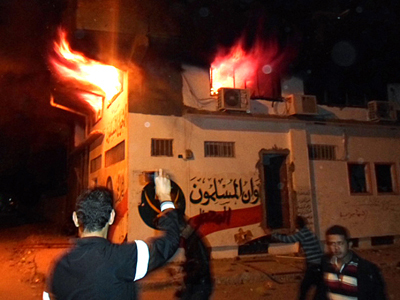 ­About 18 prisoners in Suez police stations managed to escape during the violence, a security source reported. Approximately 30 police weapons were stolen. Soldiers have taken up positions at important state facilities, including the local power and water stations, administration buildings, banks and courts. 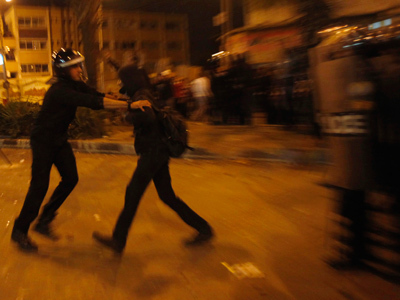 Protests have been spreading throughout Egyptian cities since Thursday, prior to the sentencing. Opponents of Morsi have been gathering to mark the second anniversary on Friday of the beginning of the revolution that led to Hosni Mubarak’s overthrow. Morsi has condemned the violence, and appealed for calm among the population. He has proposed “a broad national dialogue”, and Egypt’s army has been summoned to prevent any further escalation for the violence. However, his opposition believes that he has betrayed the economic and representative goals of the previous revolt. "None of the revolution's goals have been realized," protester Mohamed Sami told Reuters. “There’s a lot of anger towards the president – this started just at the end of last year when he pushed through what was seen as an unpopular constitution drafted by an Islamist dominated constituent assembly. People also say that he has not made any of the changes that were called for during the January 25 revolution two years ago, so he’s really lost quite a lot of legitimacy on the streets,” Trew said.